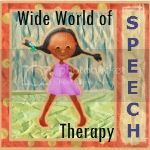 We have another special guest post from Julie at Open Wide The World and Wide World of Speech Therapy. When I last visited Naptime Tales, we talked about the benefits of reading to our toddlers. Today we’ll look at exactly how we can get the maximum benefits from each story time. Some of these tactics we moms just naturally do already; a few others might spark some new ideas. Keep age-appropriate books available within your little one’s reach. Make reading time a pleasurable experience. Limit distractions during reading time. Be sure your little one sees you and other family members enjoying reading books. Respond to children’s attempts to engage in looking at and playing with books. favorite stories and rhymes over and over. Read only as long as your child can maintain attention. Let’s kick this up a notch, shall we? cat. A little plump but not too ____,” letting your child say fat. Completion prompts provide children with information about the structure of language that is critical to later reading. Best used in books with rhyme or repetitive phases. These are questions about what happened in a book a child has already read. For example, “Can you tell me what happened to the little blue engine in this story?” Recall prompts help children understand story plot and sequences of events. These prompts focus on the pictures in books. For example, “Tell me what’s happening in this picture.” Open-ended prompts help children increase their expressive fluency and attend to detail. Best for books that have rich, detailed illustrations. Level Four: Mommy-Reader of the Year! Expand the child’s response by rephrasing and adding information to it. Repeat the prompt to make sure the child has learned from the expansion. The parent says, “What is this?” (the prompt) while pointing to the fire truck. The child says, “truck.” The parent follows with “That’s right (the evaluation). It’s a red fire truck (the expansion). Can you say fire truck?” (the repetition). Got all that, Moms? Okay, let’s get out there and create some future readers! Reading to Infants and Toddlers on Their Early Language Development.” CELLreviews 5(4), Asheville, NC: Orelena Hawks Puckett Institute. Dunst, C.; Williams, A.; Trivette, C.; Simkus, A.; Hamby, D. (2012). Children’s Language and Literacy Competence.” CELLreviews 5(10), 1-10.